The ex-Formula 1 mogul and BBC commentator is due to take delivery of his new 155ft, £32million yacht in spring but the mammoth ship has been spied leaving the boat shed early. 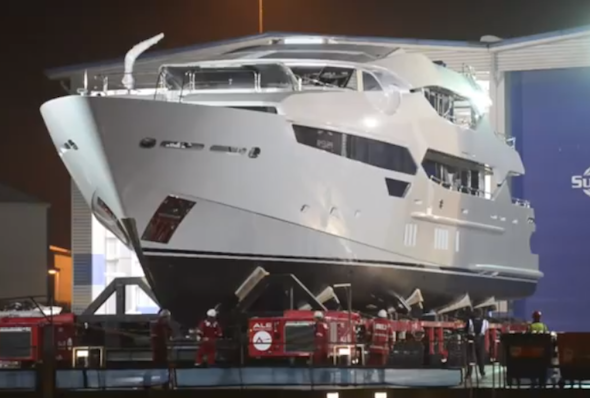 The Bournemouth Echo released footage of the Sunseeker 155 being carefully winched from the gargantuan shed in which it has been meticulously hand built over the past year. Jordan's Abramovich-bothering floating hotel is big enough to house 10 permanent staff, 12 guests, an on board nightclub, a panoramic viewing area, a dining hall, a bar and a garage that contains a set of jet skis. Stewart McIntyre, Managing Director at Sunseeker, said on the company's blog: "This is an extremely exciting time for Sunseeker as we inch ever closer to the completion of the 155 Yacht. "This is the biggest project we have ever undertaken and since the announcement of its build it has been the talk of the industry. We are incredibly proud of what we have created and look forward to showcasing it to the world." Jordan is said to have had an almost 'free-hand' when it came to specifying his new toy and Sunseeker insiders have said the interior will feature an exclusive design palette which highlights grey, blue, green and an overall 'chic aqua' feel. The former racer, Formula 1 team owner and now BBC commentator once struggled to finance his Jordan Grand Prix team – an outfit that many famous names including: Eddie Irvine, Michael Schumacher and Damon Hill began their careers at. Now, Jordan boasts an impressive business portfolio that includes hedge fund management, property, technology and events as well as providing race commentary alongside David Coulthard on the BBC.